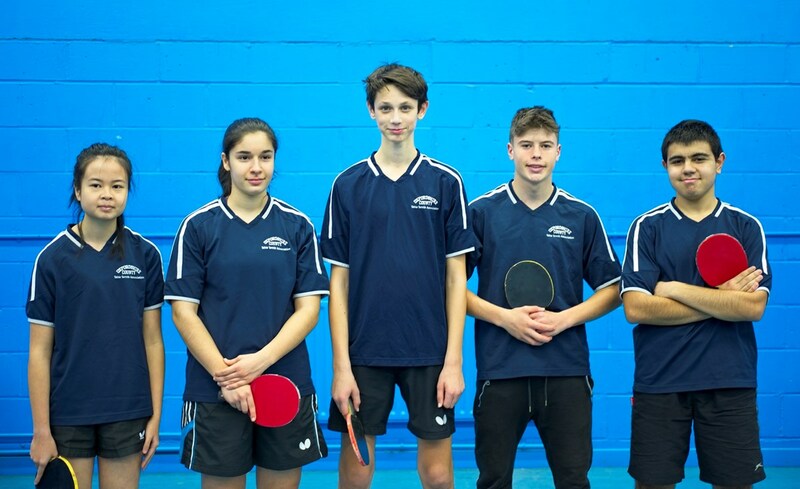 The County Junior Team at New Malden: Vicky Coll, Pelin Karabulut, Todd Stanmore, Ollie Keen & Kiarash Shaddel. After a gap of three years, Oxfordshire had enough keen girls of a sufficient standard to take up courage again and field a team in the Junior County Championships, Division 2C. Vicky and Pelin did us proud, each winning 5/6 singles and giving the boys a fighting chance against some fearsome opposition. Todd Stanmore, who has just celebrated his 13th birthday, stood up tall and played magnificently, winning 4/6. Ollie Keen found it hard going, but Kiarash Shaddel showed how much he has improved over the last year, battling to secure 3 wins/6. The first rounds of County Junior Division 2C matches were played on Saturday 3 November 2018. Every Team gained at least a point so it looks as though there could be some close matches for the final round. For this first round of matches the Division was split in to two halves, the eastern half Bedfordshire, Essex, Hertfordshire and Suffolk played one another at NETTS, Earls Colne whilst the southern and western half of the Division, Berkshire, Oxfordshire Surrey 2 and Sussex 3 played one another at the Graham Spicer venue, New Malden. All matches were played on two tables. Sadly, at the last minute, Bedfordshire found themselves with only one girl player for their team. In the opening round of matches at Earls Colne Beds played Herts. Victor Rioja and Isabelle Lacorte led their team to a 7-3 win with two wins each with Oliver Horswell winning two for Beds. Herts Samuel Flaum was the busiest player going to a decider in both his matches, winning one and losing one, both at 11-7. In the other match Essex 2 played neighbours Suffolk. Kian Burgess and James Davies-Stokes with two wins each led Suffolk to a 7-3 win. Maliha Baig would be pleased with her two wins over the higher ranked Suffolk girls. For the second round of matches Beds played Suffolk and after Joe Peckham won the opening match for Beds it was one-way traffic for Suffolk winning the remaining nine matches, two of which were concessions, and only one match not won 3-0. The match between Herts and Essex 2 finished with the same 9-1 score line to Herts. Maliha won the only match for Essex. Four matches went to a decider and Herts won them all, the closest being Samuel Flaum’s 15-13 win in the fifth game against Harry Keys. In the last round of matches Essex 2 played Beds and the result was the only draw of the day. Oliver Horswell winning two for Beds and Arran Hutchinson similarly for Essex, his match with Joe Peckham containing three deuce games including the decider at 15-13. The other match was between the two leading teams, Suffolk and Herts, each having identical points and Sets differences and Suffolk a very slight games difference advantage. Victor Rioja two 3-0 wins for Herts and when James Davies-Stokes won his second match it made the match score 4-4. Herts won the last two matches, the last match won by James Hamblett 11-4 in the deciding game. Longest match was that between Lucy Curtis (Sk) and Emilly Ravetto (He) with Lucy coming back from 2-1 down to win the last two games 9 and 9. What a difference at the Graham Spicer Centre, where match scores were much closer! In the opening round of matches Oxfordshire played Surrey 2. The first four matches were shared, all won 3-0. Then the highest ranked player at either venue, Surrey’s Nahom Goitom played Todd Stanmore, ranked 400 points below him, and he was made to work hard for his win, 14-12 in the fourth game. Todd was the only player taken to a fifth game, a 11-9 win over Ollie Maric-Murray. By winning the last match Nahom got Surrey 2 a 6-4 win. Yuvathi Kumar won both her matches 3-0. It was a right old battle on the other two tables between Sussex 3 and Berkshire. The first match between Joseph Barraclough (Bk) and Jamar McGlashan (Sx) was a marathon with Joseph just scraping home 12-10 in the decider. Joseph went on to win his second match 3-0. The girls Holly Ranson (Bk) and Sacha Ward (Sx) had an even closer marathon match with Holly eventually winning 5, 12, -13, -7, 13. It was the Sussex girl Chaudia Hough who won her two matches to gain the draw for the Sussex team. For the second round of matches Surrey 2 played Sussex 3. Surprisingly the Surrey number 1, Howard Onweng lost both his matches in the deciding games to Harry Yip (15-13) and Jamar McGlashan (11-4). Nahom, Yuvathi and Henry Maric-Murray all won both their matches and Claudia Hough the only other win for the Sussex team. Neighbours Berks and Oxon played each other and Oxon came out on top. The Oxon girls Vicky Coll and Pelin Karabulut four wins went a long way to the Oxfordshire win and Todd’s two wins and Kiarash Shaddel’s one win made it 7-3. This was after Berks had won the opening two matches through Johnson Xu and Raayan Asghar. At this stage Surrey 2 were already two points ahead at the top of their Table and they now had bottom team Berkshire to play. Nahom, who was taken the full distance by Joseph Barraclough, Yuvathi and Karishma Shah all won their two matches. A 7-3 win for Surrey 2 after losing the opening two matches. Oxon claimed the runners-up position when they defeated Sussex 3 6-4 after being 4-2 down. It was the girls Vicky and Pelin that kept the Oxon team in the match and Todd and Kiarash swung the match by winning the final two matches after Jamar had won both his matches for Sussex. The final round of matches will be played at BATTS Harlow on Saturday 1 December 2018.